Are you being paid to attend that Teacher Only Day? It comes around every year, the time when teacher only days and the set up of classes in preparation for school beginning. Every year new teachers enter the profession and teachers who were out of the profession or are on fixed term contracts come into new schools. And every year these teachers have a similar problem: getting paid for teacher only days. The issue is that the Ministry of Education says the education year begins on the 27th of January. But schools begin their year with new staff before this date. New teachers to a school are required to attend induction days, teacher only days, team meetings and set up their classrooms - and most of this is done before they are officially on the payroll on the 27th of January. This year my school begins teacher only days on the 22nd of January, yet I am not officially on the payroll until the 27th of January. But as a teacher who has come off a fixed term, and has had all the meager holiday pay I am due, am I now expected to attend several days of teacher only days and then set up my classroom ready for the new school year without getting paid? Many will say, well that is how it has always been. But I say, just because that is how it has always been, it doesn't mean it is the way it should be!! I am not saying I will not be setting up my classroom, I just choose to do it when I am actually being paid for it. We teachers are professionals, and we should be paid for every day we are in school and we should be treated as professionals, not as volunteers. Some people, particularly beginning teachers, may have to give up some actual paid employment to attend these days in school. Others may need to pay for child care. Therefore these days can be at a cost financially to new teachers to the school. And in how many other professions are you expected to work up to a week in advance of officially being on the payroll and set up your work space without being paid? It is an insult to the teaching profession to treat teachers in such an unprofessional manner. And here is the clanger: what if you are onsite working before you are officially on the payroll and you are injured in anyway? Will ACC cover you and call it a workplace accident? It really is a health and safety issue. What other employment laws will I and my new employer be breaking by me being onsite and working before my official contract of employment commences? (I mention this because the youngest victim of Pike River was not on the payroll officially when the disaster happened - not that something that bad is likely to happen in a school, it's just his family was not compensated fully for losing their precious son as a result). This year the 27th falls on a Saturday. The Saturday of Auckland Anniversary weekend. Should I spend the weekend setting up my class so I am worn out and tired for when school starts on Wednesday? Why should teachers work so many weekends anyway? Currently it is rather hit and miss if staff new to a school are paid. I've been teaching for 22 years. I've started a new school at the beginning of the year a number of times after a break in my service to study/relief teach. I only remember one new school paying me once for attending these meetings. I was younger then and less bolshy and less aware. So now I am more prepared to stand up and say we should be paid. 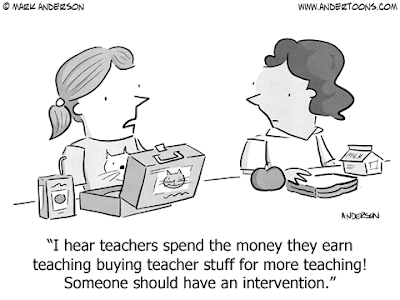 Add to the fact that, particularly for a beginning teacher, it is expensive to set up a classroom. Mostly teachers buy many things to set up the class themselves. Sometimes they can claim items back through their classroom/team budgets. But often they are buying items over and above what is necessary and creating resources from their own money to use in the classroom to enhance teaching and learning that the school may not reimburse at all. I personally think there is a simple solution to solving this issue every year. Move the date of the education year start a week forward. That way it will fully encompasses the full week before school starts and ensures new staff to a school are paid for the teacher only days, meeting and classroom set ups they will be doing. I would like to see NZEI and PPTA back this and take it to the Ministry of Education in the collective agreement negotiations this year. 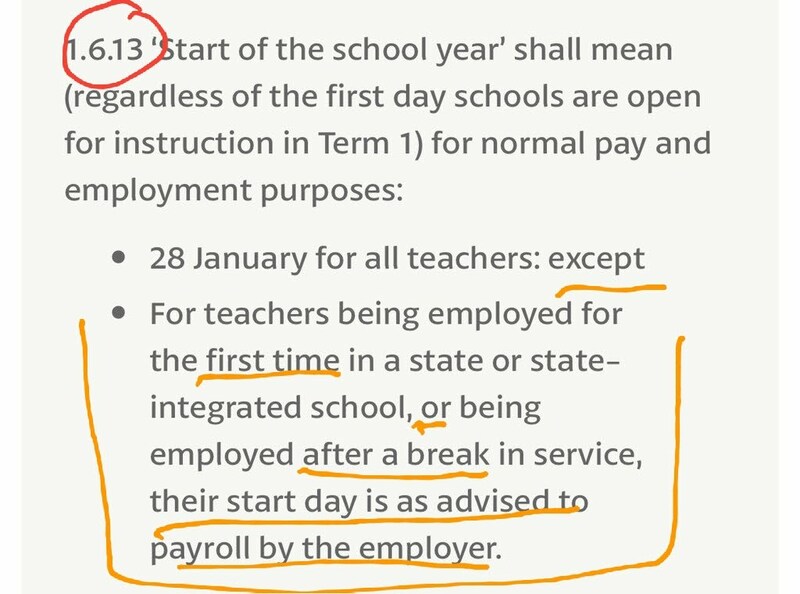 I would like to see Education Minister Chris Hipkins take some leadership on this very small change to the calendar that would demonstrate good will to new and returning teachers in years to come, especially in a time when we have a shortage of teachers to start the school year. Disclaimer: I am not taking a dig at any school, especially my new employer. I'm just stating this is a problem nationwide that needs addressing. And I have no idea how my school is approaching this issue. 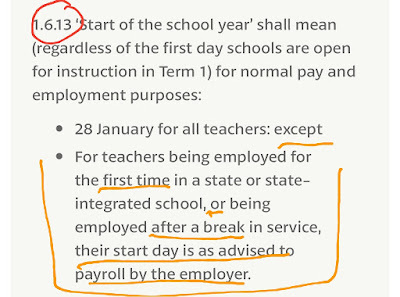 So if you find your school is not paying you for those teacher only days and meetings before the 28th of January, you now know where to find the right clause to sort that out. But it would make it easier in my eyes if the MOE start of year changed so no one missed out. UPDATE TWO: NZEI has approached the Ministry of Education for clarity, particularly as some principals have found some Novopay workers will action this and others have found some Novopay workers will not action these clauses, stating it would muck up holiday pay. I would like to see the School Trustees Association also come on board to deliver clear instructions to schools to use the above clauses to ensure people are appropriately paid.